Next time you're at Portside Wharf with the kids, whether you're saying "bon voyage" or shopping and dining, make time to visit Hamilton Recreation Reserve. 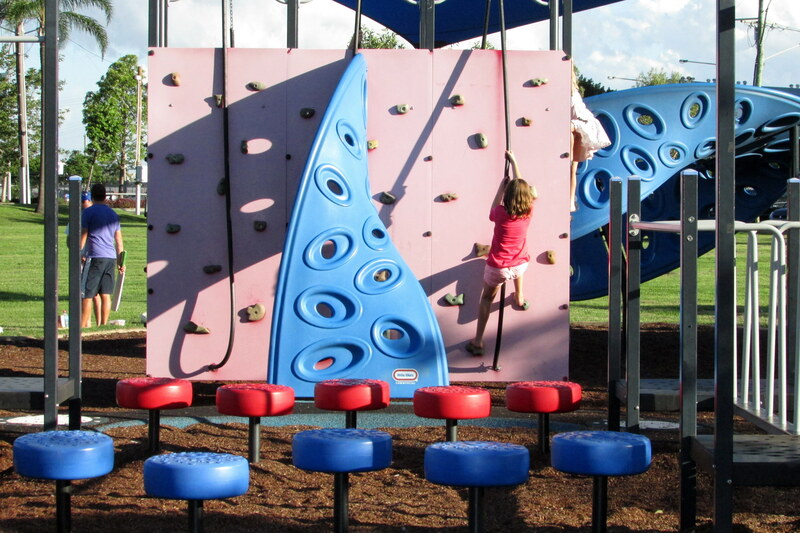 Located across the street from Portside Wharf and the Brisbane Cruise Terminal, on the corner of Hercules Street and Remora Road in Hamilton, this cruisy park has something for every member of the family. For the youngest member(s), there's a small play area situated near the amenities block. It looks a bit weathered but the cute cubby house is still a popular attraction. There are also slides and a wooden bridge, with sand and water play nearby. Older kids will enjoy the main playground, located central to the park, which looks much more recent. Here you'll find flying foxes, monkey bars, climbing structures, spinning equipment, surfboards on springs, and swings. There's also a large cruise ship play space with a small maze and spider web climbing tower. Other features include a kid's bicycle circuit, barbecues, picnic shelters, and a great, green space for sports. And for furry family members, there's a fenced, off-leash dog park complete with agility equipment. Off-street parking is available via entry on Hercules Street.